The next generation of lightweight backplates has arrived. 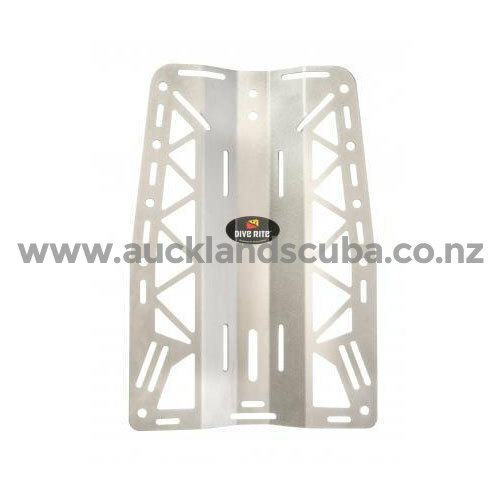 Dive Rite has taken the reliability of the stainless steel backplate and combined it with the light weight characteristics of non-stainless steel backplates. The new Dive Rite XT Lite is constructed from 16 guage 316L grade stainless steel, which is a low carbon, rust resistant grade of stainless. A series of cut-outs along the body of the plate reduce its overall weight while still maintaining the support needed for the heaviest of double cylinder configurations. All edges are laser cut, and individually finished by hand to ensure that there are no rough or jagged edges anywhere on the plate. The XT Lite backplate is configures with 11" on center mounting holes to accommodate standard double tank bolt kits, including two holes for the upper bolt to give adjustability of tank height. Two sets of 2" slots along the center allow divers to use the XT Lite for single tank diving without the need for a single tank adapter. A series of 3/8"diameter holes and 1" slots along the outer edges of the plate give different options for mounting lights, pony bottles, lift bags, and other accessories. 2" and 1" slots at the bottom center of the plate allow for any size crotch strap up to 2" in width to be used. Made in the USA.